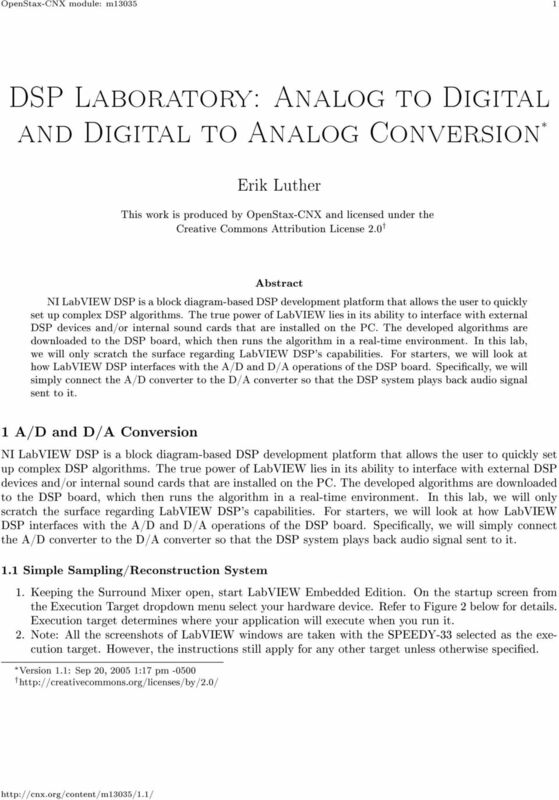 Download "DSP Laboratory: Analog to Digital and Digital to Analog Conversion"
2 OpenStax-CNX module: m Figure 1: Switch Execution Target to your DSP hardware device Start With a New Blank LabVIEW VI 1. 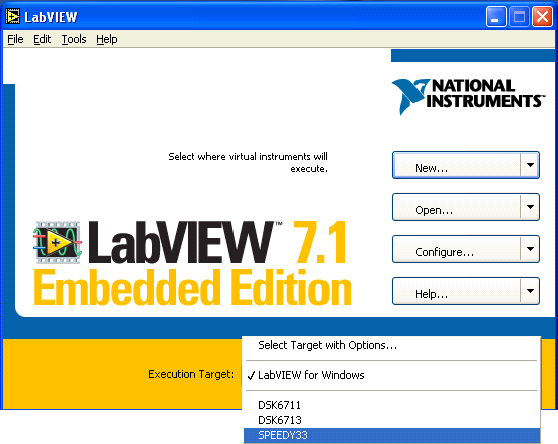 Select FileNew VI to start a new LabVIEW application. 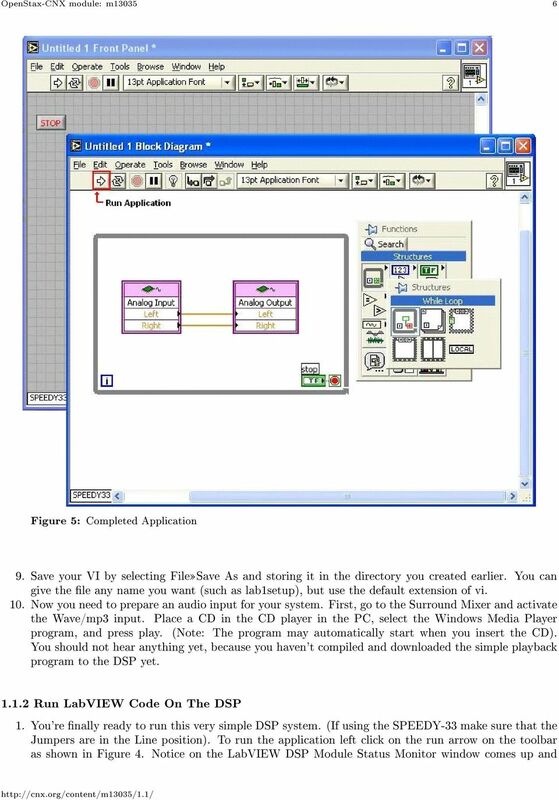 (Note: A LabVIEW application is called Virtual Instrument or VI). 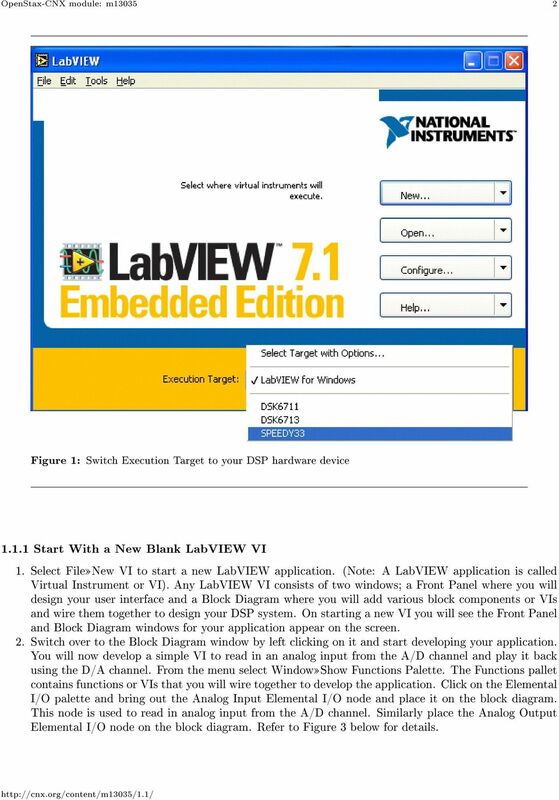 Any LabVIEW VI consists of two windows; a Front Panel where you will design your user interface and a Block Diagram where you will add various block components or VIs and wire them together to design your DSP system. On starting a new VI you will see the Front Panel and Block Diagram windows for your application appear on the screen. 2. 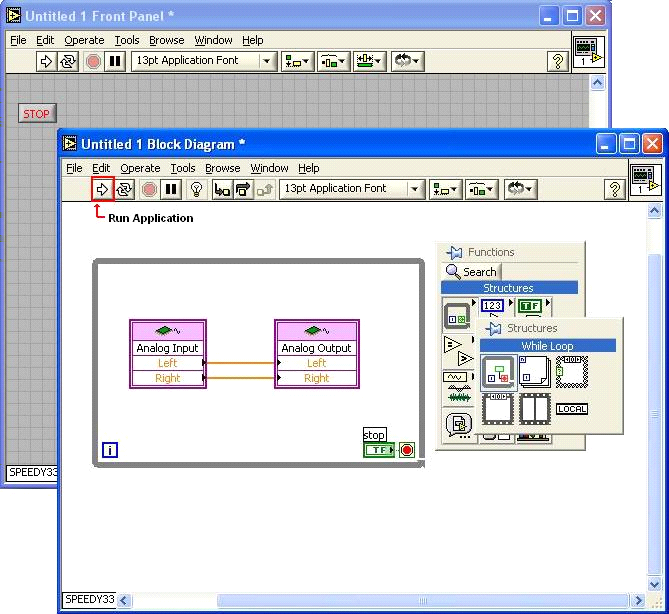 Switch over to the Block Diagram window by left clicking on it and start developing your application. You will now develop a simple VI to read in an analog input from the A/D channel and play it back using the D/A channel. From the menu select WindowShow Functions Palette. The Functions pallet contains functions or VIs that you will wire together to develop the application. Click on the Elemental I/O palette and bring out the Analog Input Elemental I/O node and place it on the block diagram. This node is used to read in analog input from the A/D channel. Similarly place the Analog Output Elemental I/O node on the block diagram. Refer to Figure 3 below for details. 5 OpenStax-CNX module: m Figure 4 7. Before running any DSP algorithm, the Analog Input and Output nodes need to be wired together. Hover your mouse over the Left channel output of the Analog Input node, the mouse curser will change to a wire spindle. 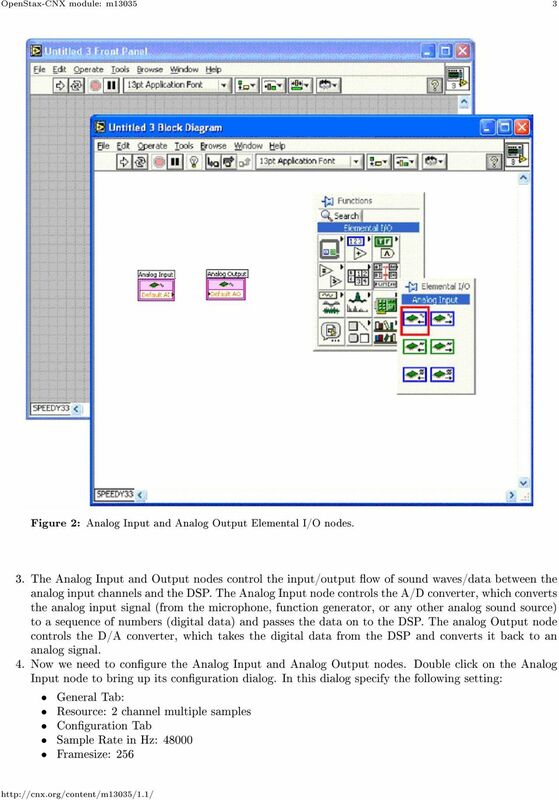 Left click and drag the wire to the Left channel input of the Analog Output node. 8. We will now place a While Loop so that the process can be run in a loop. Bring out a While Loop from the FunctionsStructures Palette. Place the While Loop around the two nodes by left clicking on the top left corner and dragging it to the bottom right. The nal application will look like Figure 4. Notice a stop button appears which is wired to the conditional terminal of the loop. You will also see a stop button on the front panel. Once the application is run you will press this button to stop the application. 7 OpenStax-CNX module: m displays the Status as the application is compiled and downloaded onto the DSP. The Memory Usage bar at the bottom displays the amount of memory being used. Once Status displays Running on Target you should hear the music through the headphones. Figure 6: LabVIEW DSP Module Status Monitor 2. To use the microphone input instead of the CD Audio input, simply mute the Wave input button on the Surround Mixer and activate the Microphone input instead. Give it a try. You can very quickly toggle between (or even combine) dierent inputs by using the Surround Mixer. 3. Stop the program by pressing the Stop button on the Front Panel. 4. Eects of Sampling Frequency on Sound Quality 5. Now we'll briey examine the eects of sampling frequency on the sound quality of both music and voice signals. 6. Run the program again with CD audio input (using the original sampling frequency of Hz.) and note the sound quality. 7. Stop the program and change the sampling frequency (in both the Audio Input and Audio Output nodes) to Hz. Run the program again and listen to the sound quality. Repeat with a sampling frequency of 8000 Hz. 8. Repeat steps 1-2 but use the microphone input instead of the CD input. 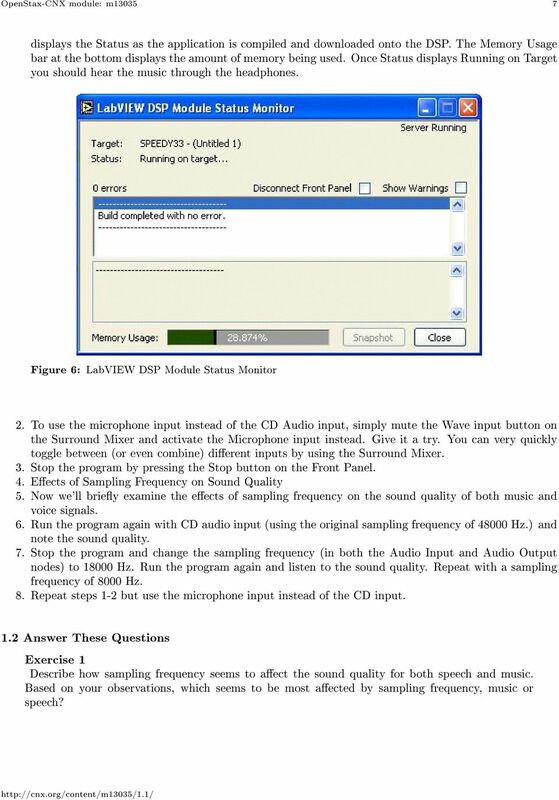 1.2 Answer These Questions Exercise 1 Describe how sampling frequency seems to aect the sound quality for both speech and music. Based on your observations, which seems to be most aected by sampling frequency, music or speech? WebEx TM Recorder and Player User s Guide for SupportCentre InterCall, a subsidiary of West Corporation, in partnership with WebEx Communications, Inc provides SupportCentre web conferencing services. Installation and setup of remote keyboard for monitoring system Multiscreen 5.x Software module «Stream MultiScreen keyboard configurator» is dedicated to control of Multiscreen 5.x over the local network. Step 1: Select the Start Menu, then Control Panel. Part of the Adobe Connect 9 software includes functionality to support full audio in addition to chat areas, shared spaces, and video. The technology that makes this possible is Voice- Over-IP (VOIP). Please reboot your system after the drivers installation.